I remember camping at state parks when I was a young kid. I didn’t know my mama could cook breakfast outside on a thing called a Coleman stove! Dang I miss those days, me and my dad casting lines from the pier or the shore line. I don’t remember what we were using as bait but it was probably one of his favorite bass fishing lures. Maybe it was a Devil’s Horse. These family experiences got me hooked and I have fished many park lakes since those days and I still do. There are many nice parks in Mississippi but my favourite has to Natchez State Park. Natchez State Park became famous a few years ago because the state record largemouth bass was caught there weighing over 18 lbs. Don’t you know my fishing buddy and I had to go check that out! It was summer time and hot. The plan was to get to the lake and get a primitive camp site set up and then get on the lake and fish a few hours and catch our evening meal. Then we wanted to get up early the next morning, fish for bass all day and then leave. We did not catch a single fish that first day! Lucky for us we brought our own beans and weenies! No, it was not luck. Anybody who fishes much knows to always take along some groceries just in case all else fails. We didn’t catch any bass that first day but we had our fishing lines broke about a dozen times. The next day we caught a few bass that were small. This lake is not huge. It is just right to get around in one day in a small boat and trolling motor. The lake is fairly deep in places, is full of fallen timber and has some vegetation in the shallows. It is a big bass breeding ground! This 9 pound bass was caught at Natchez State Park in 2012 with a plastic worm. My fishing buddy and I were not familiar with the lake on that fishing trip but on future trips we did pretty good on catching some largemouth bass. On each trip to the lake we did not take a boat with us. We took a trolling motor, a battery and a battery charger. When we got to the lake we went to the boat rentals office and rented a boat, boat paddles and life jackets. Too bad you cannot do that any more! Only a few water parks in the Pat Harrison Waterway District have boats for rent now. Heck, you can get farther up into the shallow creek channels with a smaller boat. Bring your own boat or fish from the pier, dang it! The second day we were on the lake in the boat, in the middle of the day and it was hot! It was summer time in Mississippi! Dang! My boiling brain needed some relief! As we were floating along about 50 yards from the shore line, we looked up on the shaded bank. 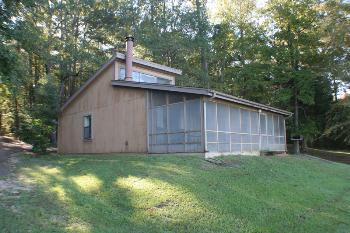 Among the pines and big oak trees was a beautiful rustic cabin with air conditioning! We both thought it would be so nice to come off the lake during the hot part of the day, get a bite to eat and take a nap in that cool cabin. Every trip to Natchez after that, we rented that same cabin. It was awesome! Those cabins have EVERYTHING but food! I would definitely recommend renting a cabin at your favorite state park and staying a few days and enjoy all they have to offer. Be sure to rent cabins a few months ahead of time according to what season you want to visit the park. From the spring all the way through the summer and fall, the cabins should be full. 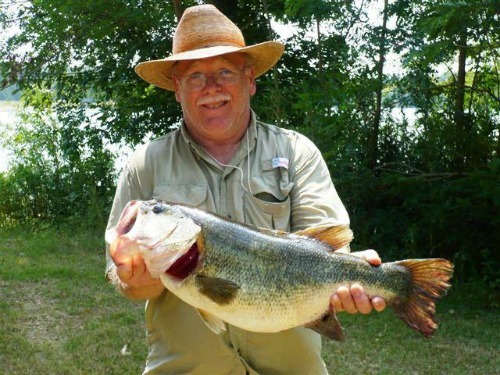 Explore more bass lakes at Mississippi Bass Fishing. More info on cabin rentals. More info on boat rentals.